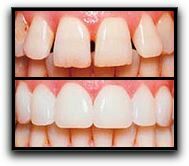 One of the latest breakthroughs in Pearland cosmetic dentistry is Lumineers, a type of prepless veneer. Though thousands of Friendswood and Alvin smile restoration clients who have received traditional veneers are happy with the results, some Texas dental clients have delayed this procedure because they do not want to lose healthy tooth structure. Pearland prepless veneers are a less-invasive procedure for transforming Houston smiles. David C. Montz DDS, PA & Associates Lumineers are incredibly thin shells which adhere to the face of teeth and require no removal of tooth enamel. Most Lumineers are about the thickness of two pieces of paper. Because the color is built into the veneers (instead of being applied after fabrication), they look like your natural teeth–only better! Our experienced Texas ceramists are skilled artists. They create each custom Pearland veneer with the optimum shape, color and thickness for your new smile. Another great feature of the David C. Montz DDS, PA & Associates – Family, Cosmetic and Implant Dentistry prepless veneers application procedure is that it requires no anesthesia or drilling. If you are embarrassed by misaligned, discolored or broken teeth, Alvin prepless veneers may be a Texas smile restoration solution that you can feel good about. Call David C. Montz DDS, PA & Associates – Family, Cosmetic and Implant Dentistry to learn more about Pearland prepless veneers. It is the first step toward your dazzling new smile!